As real estate investors, I think we all have something in common. We’re all extremely ambitious people. Let’s be honest – if a person hopes to accomplish anything great in this world, they must have some kind of personal drive, hunger or zeal. If you’re serious about the real estate investing gig, ambition just has to be part of the equation… there’s no way around it. It’s what pushes us to find that next great deal, take our business to the next level and make a ton of money. This is what drives most people into real estate investing – call it ambition, desire, passion, aspiration or initiative – I don’t know anyone who would disagree that these are all very admirable qualities. The people who posses these traits usually end up doing a lot of great things in life. They’re the ones responsible for the greatest achievements, innovations and improvements that have come to fruition throughout the course of human history. Like most people, I’ve always thought that ambition was a wonderful thing, but I think there’s another side to the coin that most people completely fail to see. I don’t know about you, but I’ve seen many instances where things like “dreams” and “success” have caused a lot of unintentional damage to people. The real tragedy of it was, most of the victims didn’t even recognize the problem until years after the damage was done. For many of us, there is a lot of truth and helpful motivation that can come from these statements – but as with anything, we need to have balance. When we’re constantly focusing on what’s next, I think there’s something very important that gets left in the dust of our business pursuits. It’s called the present. When was the last time you recognized that that today is a gift? Did you know that this moment is one you will never get back? What kinds of wonderful things are happening in your life, right now, that you’re too busy to appreciate? The truth is, we all have a lot of great things going for us right now (regardless of how much time we spend thinking about it). When was the last time you sat back and just appreciated your life for what it was? I’ve know of many people (and you probably do too) who are flat-out addicted to ambition, as if it’s a drug they can’t walk away from. The unfortunate truth is – it’s very easy for ambitious people become workaholics and to be proud of it. Why? Because things like hunger, drive and aspiration are all supposed to be GOOD things – right? 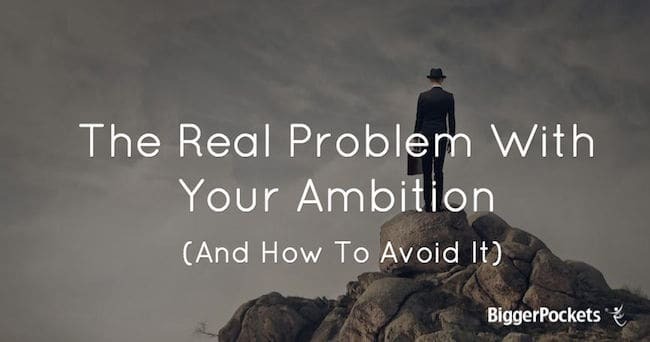 Ambition can be one of the most convenient and justifiable excuses to ignore your family, friends and other relationships – all of which matter far more than your work does. The problem is, when you have something like “ambition”, “success” and “drive” to blame your behavior on, who can argue with that? You won’t hear many of those motivational speakers telling you otherwise… after all, you’re just trying to create a better life for yourself and those who depend on you – who cares if it hijacks and consumes the best years of your life in the end? If you spend a lot of time in the real estate investing space, it’s very easy to get caught up in the excitement of the profession (because it is really exciting), but I think it’s important for us to take a breather every now and then and reflect on what we already have, where we are, where we’ve been, and lastly – where we’re going next. Think about the importance of your next big deal (or the one you’re currently working on)… how important is it, really? Is it worth the sacrifices you’ll have to make to get the job done? Oftentimes, the answer will be a resounding “YES” – but at the same time, I think we also need to allow room for the possibility the that answer may occasionally be “No“. It’s important to keep in mind that some day – decades after you and I are gone from this world, the actions that are going to make the longest-lasting impression usually aren’t real estate deals. Don’t forget that real estate investing (like any profession) is a means to an end, and unless you really intend for it to consume your life (and I doubt that you do), it’s probably in your best interests to make sure you’re balancing things out appropriately. Believe me – I know better than anyone how easy it is to allow the wrong things to end up in the wrong places on my priority list. I have to constantly check myself to make sure I’ve got things straight (because the moment I stop paying attention, things tend to get out-of-whack almost immediately). If you’re struggling to keep your priorities straight, here’s a suggestion for you… rather than allowing your family, friends, health and spirit to get whatever is left of your time and attention – think about giving these things the first share of what you have to give (not the leftovers). How can you do this? Try to put an actual appointment in your calendar (with alerts, reminders, the whole nine yards) to be present with your family and friends and to take care of yourself both spiritually and mentally. At a bare minimum, you should treat these things with the same level of importance as your business activities – carve out the time and energy required to serve these areas first and you may be surprised at what this can do for your psychological health, stress levels and overall satisfaction with life. Great topic. Well-expounded. Good job. I have been thinking about this a lot lately. A lot. I am going to keep this essay and come back and read it from time to time. It’s a little bit like an alcoholic’s anonymous speech for ambition anonymous. Hi Jason – thanks for letting me know your thoughts – I’m glad this post was helpful to you. I think we’ve all got our issues with keeping priorities in check (I’m certainly no exception). As with anything, the first step to solving the problem is to simply being aware of it (which is something that never even occurs to most people). I wish you all the best with this! Excellent! Actually what I needed to hear today Brandon as I am guilty of having the “so busy growing the roses, I never stop to smell them” mindset. Taking inventory of what is important, family, faith, and friends even while working diligently to improve the world for all three is an important but often difficult balance to strike! But worth the effort! I hear you Ged – I think we can all relate to this on some level (at least, I certainly can). Thanks for chiming in! Great article Seth! One of the things they teach in Canfield coaching was to strive for free time as much or more than to strive for money. Let other people work for you and use your time for the things you love, not always work. It is hard to do though! Balance has been a challenge for me; there is always so much to do. It is kind of the “curse of the entrepreneur”; the fact that we love our work. But you are right. Today is a gift so it’s essential that we figure it out. I agree Sharon – it’s been a real challenge for me as well. I suppose it’s better to be busy than lazy… but at the same time, we can always get too much of a good thing if we’re not careful. I am just starting to read the bigger pockets articles and i alredy can see that it is great stuff. As Jason, I am going to keep this post close enough to ready it again! Awesome, glad to hear it Rafael! Great article. I am currently tryig to decide if I want to buy more properties, which I have made a verbal offer on, or just take what I have and ride off into the sunset. My retirement plans are set to retire in two years, at 56. I could retire now, but I need “just a bit more”. 56 is still you ng…hopefully. Another building and more renters, would hopefully not delay the end goal, and would give me more that I am projecting now. Which is more than I need. When is enough, enough, that is the age old question. That’s certainly a challenge Eric… and it’s even more challenging when there isn’t a clear cut answer to the question of “what to do” in those situations. I wish you the best in coming to your final decision. This is awesome. After all, what’s the point of being successful if you’ve got nobody to share it with? Lol – I’m right there with you Karin. This time management thing is never easy, is it? Excellent Article, thanks for sharing such great insight. No problem Tyler – I’m glad you enjoyed it! Guilty as charged. Great video as well. The drive to have a backup plan when corporate America grinds me to dust and spits me out occupies 90% of my thoughts. I find that I don’t want to hang out with non investors because I don’t want to talk about anything else exept for investing. Conversations at dinner are me politely smiling and noding, meanwhile Im crunching numbers and counting money on a property I don’t even own. Haha. Sad state of affairs. Wow – that’s was very eloquently said Chuck. I have totally been there before. It is very easy to “check out” of anything & everything that doesn’t add fuel to the fire of our dreams, but in my experience, I’ve always halfway regretted doing this kind of thing (especially when my dream doesn’t pan out as planned in the end). Don’t lose sight of the present! It can be helpful to really ask yourself what your values are – do you value things like respect, power, dominance, or money per se? How about things like perfectionism, excel-ence, superiority, or mastery? Prosperity, abundance, security, independence? Peace, tranquility, predictability, or social relationships? It can be neatly illustrated by choosing a reason or a value, and then continually subjecting it to the question “Why?” Eventually you either get to “tranquility” and “independence” or you get hung up with “out-competing others” or “showing my dad how worthy I am.” We can spend a lifetime in pursuit of impure goals or immature needs. I can tell you’ve thought this through Jason – thanks for your input. There is probably a lot more we can dig into with this subject! Finding the right work/life balance is always tough. More so for the entrepreneurs since we have no start and end to our work days unless we MAKE them. It is always good to step back and make sure we remember what our actual goal is, rather than just hording money and assets for the sake of having more money and assets. Thanks for sharing Shaun – I’m glad this stuff resonated with you too.